The Venezuelan foreign minister traveled to Washington and met with a top State Department official in late July, one week before President Nicolas Maduro pressed ahead with an election that dismantled the country’s democracy and cemented his leadership. The State Department previously did not disclose the meeting and many key members of Congress did not know about it, according to several government sources. Vice President Mike Pence plans to speak to a Venezuelan enclave of Miami late Wednesday afternoon to reassure the community that the Trump administration is taking a strong, carefully planned approach. Ahead of that speech, news of the late July meeting and new details about a State Department push to begin a potential mediation with the Maduro government—possibly through a third party—is sparking new concerns that the White House and State Department aren’t unified on their strategy to resolve the political and economic crisis in Venezuela. 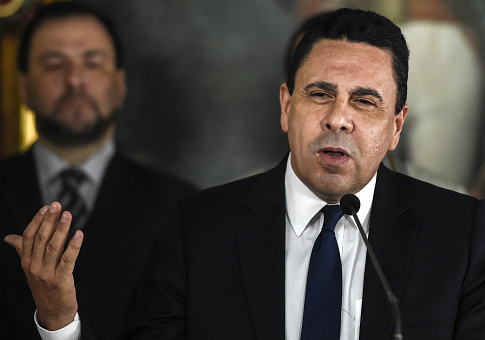 The State Department confirmed the meeting between Tom Shannon, undersecretary for political affairs, and then-Foreign Minister Samuel Moncada took place July 23 but would not discuss details of the discussions. "We do not discuss diplomatic conversations," a spokesperson for State’s Bureau of Western Hemisphere Affairs told the Washington Free Beacon. "We maintain diplomatic relations with Venezuela and raise at all levels our call for the government to suspend the Constituent Assembly." The White House did not respond to an inquiry asking if it knew about, and signed off on, Shannon’s July 23 meeting. National Security Council staff are usually aware of foreign diplomats’ trips to Washington, especially when those visits involve meetings on Capitol Hill. A knowledgeable source said Sen. Bob Corker (R., Tenn.), chairman of the Senate Foreign Relations Committee, also met with Moncada in late July. Advocates for stronger sanctions against Venezuela worry that the State Department meeting between Shannon, Secretary of State Rex Tillerson’s right-hand man at the department, and the Venezuelan foreign minister is another sign that the State Department is pushing back against more aggressive sanctions in favor of a greater dialogue with Caracas. "In any negotiations, both parties have to be willing to go to the table, and so far, Maduro continues to go to the table and provide nothing, and he uses these dialogues and mediations as stalling tactics" to put off more sanctions, a government source told the Free Beacon. "The Maduro regime does not want to dialogue in good faith," the source added, noting that other third parties, including the Organization of American States and the Vatican, have tried and failed at mediation attempts. Shannon is pushing for a new mediation dialogue with Venezuela that would have a budget of $500,000 to $1 million and operate out of the State Department’s Bureau of Conflict Stabilization Operations, or CSO, an office that helps the U.S. government anticipate, prevent, and respond to conflict and promote long-term stability, according to a government source briefed on the plan. Another source, who is more supportive of Shannon’s efforts, suggested that the Trump administration could do both: engage in greater dialogues with the Venezuelans while threatening more sanctions and issuing them if needed. Opposition leaders in Venezuela are open to a negotiated outcome but want tougher sanctions now from the United States and other countries to gain leverage and take advantage of an acute financial pinch Maduro will face in the coming months. The Venezuelan government has roughly $2 billion in available cash to make a $1.3 bond payment on its debts by the end of the year, according to a Reuters report. Opposition leaders would like the United States to ratchet up the financial pressure on Maduro while State keeps an open channel of communication to all parties in Venezuela, the source said. A seasoned diplomat who has served as assistant secretary of state for Western Hemisphere Affairs, Shannon is well-versed on the political dynamics and players in the region. He also served as a counselor at the U.S. Embassy Caracas from 1996 to 1999, and had a front-row seat for former Venezuelan President Hugo Chavez’s revolution. Shannon owes his ascension to the No. 3 post at State to former President Barack Obama. He has many fans in conservative circles as well but at times has angered democratic and human rights activists in Washington and around the world. In 2015, critics slammed Shannon for meeting with a Maduro ally, then-national assembly president Diosdado Cabello, who was a target of a U.S. criminal investigation into drug trafficking by senior Venezuelan officials. Some also blamed him for holding up sanctions against Venezuelan Vice President Tarcek El Aissami for alleged drug trafficking involvement last year. Democratic activists and those in Congress pushing for a tougher administration stance, hope Pence’s remarks Wednesday will clarify the strategy after weeks of mixed signals from the Trump administration. Pence will deliver a speech in Miami Wednesday at the Catholic Church in Doral, Fla., and Gov. Rick Scott and Sen. Marco Rubio (R., Fla.) are expected to attend. Pence’s task of laying out a strong and deliberate strategy became more challenging when President Donald Trump on Aug. 11 said he would consider a "military option" in Venezuela, a remark that gave new ammunition to Maduro's allies but was cheered by some democratic activists in the United States and abroad. Those encouraged by the remark believe it was simply stating a hallmark of foreign policy—not to rule out any solutions—and has forced Maduro and other leaders in the region to take the U.S. seriously. The Doral visit will serve as a cap to Pence’s travel to Latin America last week, where he spent time trying to build support for stronger Trump administration sanctions against Maduro. It’s unclear if the vice president will announce additional sanctions during his speech Wednesday. Before his trip to Doral, Pence will visit the headquarters of the U.S. Southern Command.